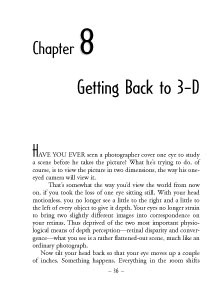 To regain a three-dimensional view of the world, Mr. Brady suggests two approaches: create relative motion, or use the techniques used by artists to lend depth to a two-dimensional scene.  * Objects in the foreground take up more of the window's space than objects of the same size in the distance. Automobiles. which are fairly standardized in size, are a good gauge of this. Leonardo calls this phenomenon"diminishing perspective."  Colors are bolder and brighter in the foreground. In the distance, they become softer an muted. By the same token, shadows of nearby objects are sharper and darker. The artist calls this "color perspective."  Finally, objects in the distance tend to blur, while those in the foreground are more clearly defined--"vanishing perspective."